Media Checker scans CDs, DVDs and folders for unreadable files. It actually could be the application to use before trying to recover those unreadable files with an application like CD Recovery Toolbox. Most users will not notice read errors on CDs or DVDs until they try to access the data which often means that it is to late to recover them fully. Media Checker is a software that can prevent this from happening if the user is testing the CDs and DVDs containing the important data regularly with it. Testing media is time intensive and I would be doing nothing else if I would check all of my burned CDs and DVDs. Some data is more important than the other and it's probably a good idea to concentrate on that data only and not on the backups of last year that have been replaced by hundreds of newer backups. 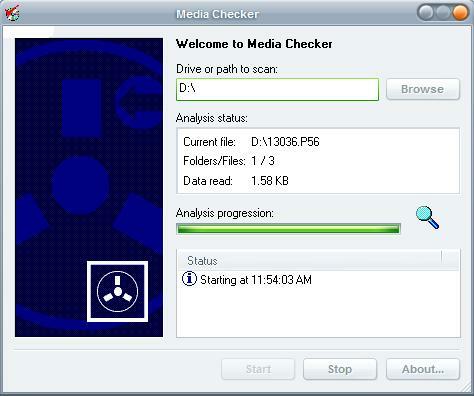 Media Checker is a portable application, it can be run from any location. The user has to select a directory or disk and click on Start to start the scan of the data. Files that fail the check will be shown with a red icon which makes it easy to distinguish them from the readable files. If files are not readable anymore you could try the aforementioned Cd Recovery Toolbox or Iso Puzzle which utilizes different CD and DVD drives to recover the data.